This oil drizzler and vinegar bottle will add chemistry to any meal. 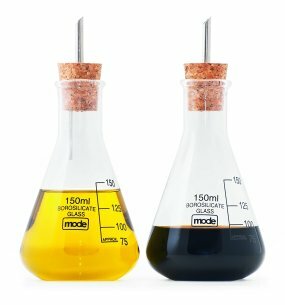 Shaped like science lab flasks, you can drizzle your olive oil and balsamic vinegar in style thanks to this quirky cruet set!If you are looking for a unique house warming gift, or perhaps you feel like jazzing up your own kitchen, this Earl Oil and Vinegar Set is the perfect addition. Made from real glass, these genuinely look like they have been taken from a science lab! Why not pop some garlic cloves or chilli into your olive oil? This will not only create tasty flavours, but looks fantastic in your new cruet set!